"M-GO offers a fantastic selection of movies and TV shows that we know our customers will enjoy." The movie and TV show shortcuts powered by M-GO will be available in the U.S. on the new Roku LT, Roku 1 and Roku 2 players, and will automatically roll out as a free software update beginning in October to all current-generation Roku devices – the Roku LT (models 2400 and 2450), Roku HD (model 2500), Roku 2 HD, Roku 2 XD, Roku 2 XS and Roku 3 players as well as the Roku Streaming Stick. There will also be a M-GO button on the new Roku LT (model 2700), Roku 1 and Roku 2 remotes, so consumers are just one button push away from the entertainment they crave. 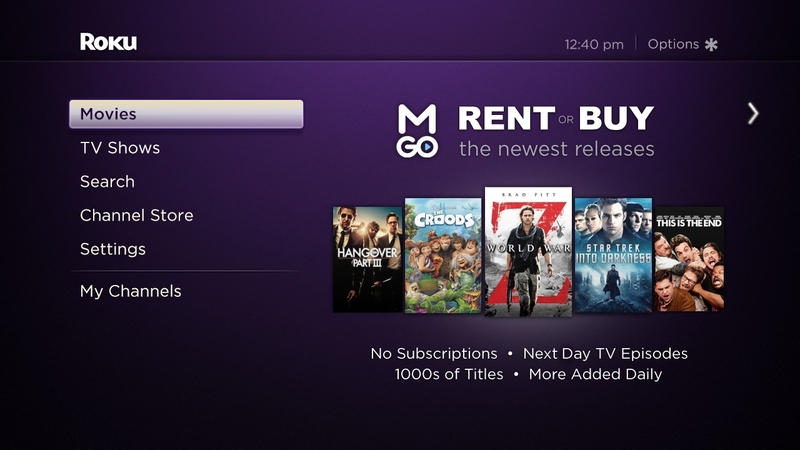 To celebrate the partnership, all customers who activate M-GO on Roku between October 1st and December 31st will get two free movie rentals of their choice. M-GO is the people-friendliest, new pay-as-you-go digital entertainment service that makes it easier than ever to browse, rent, buy and enjoy the broadest, newest and best selection of movies and TV shows on your screens. M-GO was created by people who love entertainment for people who love being entertained and is a joint venture between DreamWorks Animation and Technicolor. With both technology and entertainment in the company’s DNA, M-GO’s mission is to transform the world of digital entertainment on the viewer’s terms. M-GO is available on all major platforms and functions on a full spectrum of operating systems ranging from Android to iOS to Windows. M-GO is a free service available at www.mgo.com.